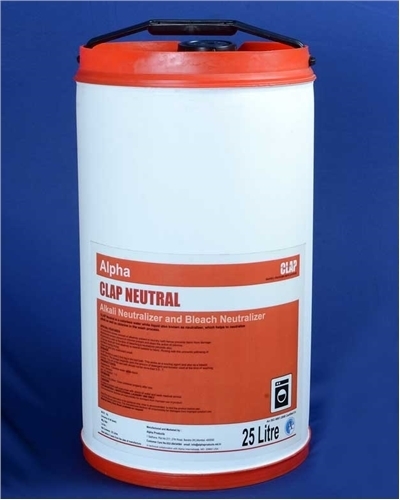 CLAP NEUTRAL is a colourless water white liquid also known as neutralizer, which helps to neutralize alkali as well as chlorine in the wash process. It neutralizes excess amount of alkalinity present in laundry bath hence protects the fabric from damage. Neutralizes excess amount of chlorine present and stops the action of chlorine. If peroxide is used at the time of bleaching, it neutralizes peroxide also. It brings down pH from alkalinity to neutral suitable to fabric. Rinsing with this prevents yellowing of the fabric during drying. DOSAGE : CLAP Neutral is used 2.5 ml / kg.in the last bath. This works as a souring agent and also as a bleach neutralizer. The dosage depends upon the amount of detergent and booster used at the time of washing process. The pH of the last bath should not be more than 7.5. Appearance: Colourless water white liquid. STORAGE: Store in a dry place. Close container properly after use. Note: the above information is for guidance only. User is recommended to test the product before use. For Professional users only. The manufacturer declines all responsibility for damages from improper product use. Material Safety Data Sheet available on request.